Made for everyday wear or with the athlete or medical patient in mind, Incrediwear knee sleeves can bring comfort to your body within minutes of putting them on, giving extra joint support needed for sprains, meniscus tears, tendonitis and arthritis. 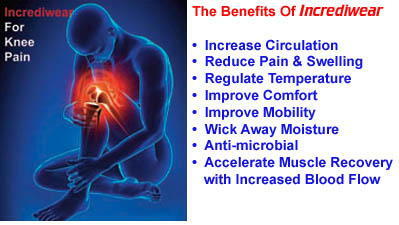 Incredibraces support the injury and use the addition of a patented organic germanium bamboo charcoal blend making this sleeve ideal for anyone experiencing discomfort related to circulatory issues, or anyone who has suffered a sports related injury, arthritis, or injury from repetitive use. Increased blood can help to decrease swelling and increase mobility leading to a reduction in pain. Incredibrace knee sleeves are antimicrobial, odor absorbing and moisture wicking for supreme long wearing comfort. Incredisleeves are the ideal choice for the active or inactive, sports enthusiasts, arthritis sufferers or those just seeking the best comfort available in a medically designed brace. Anti-microbial Try it - you won't be disappointed!